Paradise Valley is a jewel in the middle of the Arizona desert. Like many Phoenix-area towns, Paradise Valley has roots that go back into the late 1800’s, but was actually incorporated years later in conjunction with a building boom in the state. What has happened since the town’s incorporation in 1961 would make the town founders wish that they had bought more land. The town now has 12 upscale resorts that draw tourists throughout the year, and median home prices of $1.75 million, and some mansions in the $10 Million to $40 million range. Paradise Valley is an affluent small city of about 15,000 and is located about 15 miles outside of downtown Phoenix, and nine miles from the heart of Scottsdale. The town is sometimes confused with Paradise Valley Village, a municipality inside of Phoenix. The town has been home to U.S. Senator Barry Goldwater, who is honored there with a memorial statue; former Supreme Court Chief Justice William Rehnquist, World Champion Boxer Muhammad Ali, author Clive Cussler, and classic film actor Charles Boyer. Although Paradise Valley boasts world class resorts and a long list of famous residents, it is primarily a residential community. Town planners are committed to keeping the suburban feel of the community. 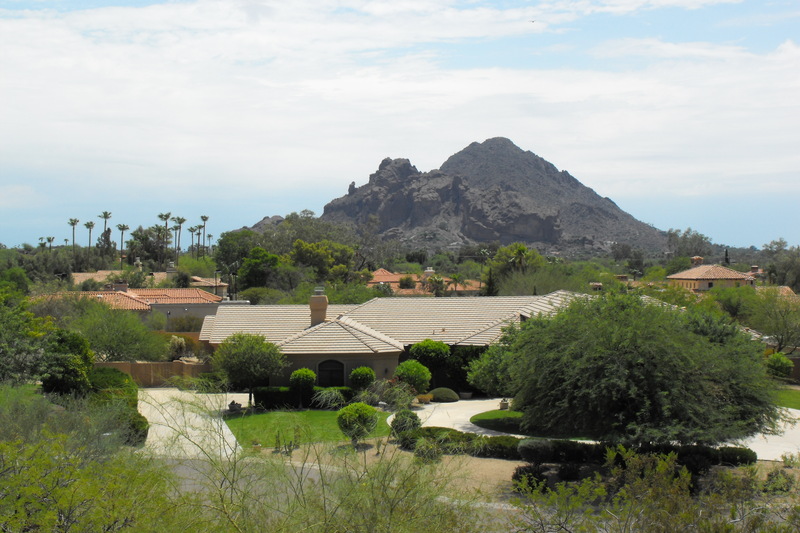 Residents enjoy the amenities that one would expect in an upscale residential community while also being able to take in clear views of Arizona natural landmarks like Phoenix Mountain Preserve, Camelback Mountain, Mummy Mountain, and Indian Bend Wash. Golf and Tennis opportunities are plenty, as are the possibility of day long hiking and biking excursions to the nearby vistas. Paradise Valley is home to many local shops and boutiques, but residents in need of a mall drive to Scottsdale or Phoenix. Shoppers often spend hours poking around in Scottsdale Marketplace, an antiques store. In town, “recycled designer clothing” can be found at Well Suited, for men, and at My Sister’s Closet, for women. Three major grocery chains service the town’s food needs – AJ’s Fine Foods, Trader Joes, and My Fit Foods. There is fine array of upscale dining establishments, particularly if one ventures to any of the resorts. "Elements", the restaurant at the Sanctuary - Camelback Mountain Resort and Spa, cooks up in-house smoked meats, as well as vegetarian and gluten-free options. The restaurant utilizes organic, locally grown foods wherever possible. Downtown Paradise Valley has lots to offer, too. Lon’s at the Hermosa Inn, a boutique hideaway, creates specialty breakfasts, lunches and dinners. Those craving a taste of the east need only make it down to Tottie's Asian Fusion, where food-lovers enjoy authentic Thai, Chinese and Vietnamese dishes. Another good bet is Rancho Pinot, where the menu changes frequently to allow for variety and seasonality. Paradise Valley does not have a Parks and Rec department, but that doesn’t stop locals from living healthy lifestyles and staying active. Many locals take advantage of memberships at local resorts or country clubs, providing opportunities for swimming, tennis and more. The same activities can be found at the Scottsdale/Paradise Valley Family YMCA, which also puts on organized sports activities for adults and kids. Locals also know to head over to the Indian Bend Wash Greenbelt, near Scottsdale, to take advantage of parks, lakes, public art and golf courses. There is also plenty to do in the way of hiking and exploring, and even conducting amateur archeological digs. The Echo Canyon Trail and Recreation Area — part of Camelback Mountain — is a popular and historic hiking area, featuring spectacular views of the greater Phoenix area from its 1,280 foot peak. A cave on the north side of the mountain was discovered containing artifacts from the pre-historic Hohokam Culture, which abandoned the desolate area in the 14th Century. To get to the top, hikers ascend to the peak via one of two trails, keeping an eye peeled for a variety of desert wildflowers on the way up. Most hikers know that this area is not for novices, and hike with friends. One of the things that keeps Paradise Valley unique — and boosts home values — is the town’s leaders commitment to keeping the city a low density area. Rules are in place that allow only one house per acre, helping to keep open space between homes. Other criteria include such things as height of each home, how many horses a specific size property can have on it, and more. There are many places of worship in Paradise Valley, as well as strong community involvement in government and elections. Students from Paradise Valley attend schools in the Scottsdale Unified School District. The district has 33 schools and serves around 26,000 students each year. Cherokee Elementary School, a Pre-K–5 school, is located in Paradise Valley. Junior high school and high school age students commute to one of the other schools located in Scottsdale. Honor Health is the closest medical facility and provides services to residents of Paradise Valley. Residents also find family practice doctors, dentists and veterinarians in both Scottsdale and Phoenix. Valley Metro provides limited service to Paradise Valley, with routes to Scottsdale. To work with a team experienced with listing and selling Arizona Residential Real Estate contact Tony & Suzanne Express today! Search for Paradise Valley Area Real Estate Now! All images purchased and licensed from Shutterstock or were taken by the author unless otherwise noted below. This post is one of the 14 required entries in the "2016 Blog JUMPSTART Challenge-Grow Your Personal Best for YOUR Success" contest. Tony and Suzanne, this post is making me want to hire the de-clutterer, call the painting contractor, lure Debbie Gartner down here to supervise the restoration of my old floors, and pack my bags for Arizona! This place sounds just wonderful. Patricia Kennedy We would love to help you find the home of your dreams!